A story recently published in the Arizona Daily Star caught my attention the other night. Titled, “Blood draws by officers in DUI stops questioned“, the article indicates a recent victim of this barbaric police practice has filed a Notice of Claim with the Pima County Sheriff’s Department. The claim references a persistent blood infection, centered around the needle entry point, that still exists months after being forced to endure a blood draw by a minimally trained sheriff’s deputy during a traffic stop under unsafe and unclean environmental conditions. A Notice of Claim is the first step necessary in order for an individual to file suit against a government official/agency in Arizona. This practice of forcing individuals to submit to blood draws during DUI investigations is nothing new for the Pima County Sheriff’s Department. A few years ago, a deputy tortured a man who initially refused to allow a blood draw by tasering him on the back of the neck. The man eventually submitted to the blood draw but during litigation, the Sheriff’s Department was forced to drop all charges against him and change its taser policy to prohibit their use to coerce blood draws in the future. Additionally, at least one Tucson law firm has posted information regarding this barbaric police practice along with supporting legal documentation. 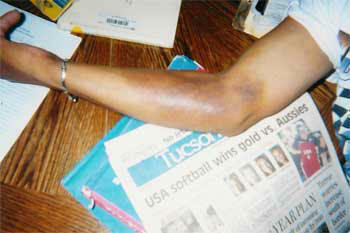 A photo provided on Charnesky & Dieglio’s website shows the damage one individual suffered as a result of a coerced police blood draw by a minimally trained deputy. While many folks feel this issue doesn’t affect them because they never drink and drive, this would be an incorrect assumption. Given the proliferation of suspicionless sobriety checkpoints across Arizona, everyone is now at risk. Case in point, the Pima County Sheriff’s Department has conducted approximately 80 suspicionless sobriety checkpoints over the past two years. During these checkpoint operations, over 50,000 individuals have been stopped absent reasonable suspicion or probable cause of wrongdoing. Of these 50,000 individuals, over 1,200 have been forced to take field sobriety tests but only 300 or so have been arrested for DUI. Of these 300 arrests, only 80 have been successfully prosecuted. This means that of the 1,200 people initially suspected of DUI, over 93% were innocent. If we include everyone stopped at Pima County sobriety checkpoints over the past two years, this number increases to a 99.7% innocence rate. As such, it doesn’t take a rocket scientist to realize that sheriff’s deputies are forcing innocent individuals to undergo intrusive and dangerous blood draws by minimally trained non-medical enforcement personnel under threat of losing their drivers license for over a year. Such police state enforcement tactics shouldn’t be confused with ‘serving’ and ‘protecting’ local communities. They’re nothing more than excuses to dominate, intimidate and control the traveling public and shouldn’t be suffered by a free people. Attorneys are putting new scrutiny on a practice that has become common among law enforcement: having officers, not medical personnel, draw blood with syringes in suspected drunken driving cases. That comes after a man developed a persistent infection at the site of a blood draw administered by a Pima County sheriff’s deputy. He has filed what is believed to be the first claim in Arizona against the practice, which could put local taxpayers on the hook for any damages. Arizona law requires that drunken driving suspects submit to a test or lose their license for a year, and it’s the officer’s choice, not the driver’s, whether to use a breath or a blood test. The Pima County Sheriff’s Department has relied exclusively on deputy-administered blood draws for years. But defense attorneys have zeroed in on the practice, arguing police officers do not receive adequate training to do the blood draws, don’t have the health and safety of suspects as their top priority and put suspects at unnecessary risk. Now the man who believes an officer-administered blood draw caused his persistent infection has filed a claim against Pima County and the Pima County Sheriff’s Department. A claim is the first step in a lawsuit. “I think most of the public does not realize that law enforcement personnel are doing the draws,” said Michael Bloom, an attorney in the case. According to the claim, James Green, a 31-year-old test pilot who works out of Pinal Air Park, was stopped by a sheriff’s deputy March 27 and arrested on suspicion of driving under the influence. After being told his driver’s license would be suspended for 12 months if he did not consent to a blood test, he agreed to allow the draw. The claim says Green’s arm became swollen and very red around the site of the blood draw within a few hours. Five months later, he had undergone several rounds of treatment with antibiotics and still had the infection. The claim says Green can work only intermittently because of the infection and may face long-term health consequences. James Charnesky, Green’s lawyer in his criminal case, is working with Bloom on the civil case. He succeeded in getting charges dropped after arguing that the way the blood was drawn violated Green’s due-process rights. Even though Green is seeking $500,000 in damages, Charnesky said the motivation behind the lawsuit is to change the practice. Lt. Karl Woolridge, the Sheriff’s Department Special Operations commander, said deputies do blood draws because blood is more accurate than breath, and the closer to the time of the crime the evidence is collected, the more accurate it is. “Our goal is to have fewer cases go to trial because we have better evidence,” he said. The Sheriff’s Department does not track conviction rates, and the deputy county attorney who oversees DUI prosecutions could not be reached for comment. Woolridge said Green’s claim doesn’t tell the whole story, but he could not comment on the specifics because of the likelihood of a lawsuit. The Sheriff’s Department has since changed its Taser policy. Also, if the arm isn’t positioned properly or if the person is standing, there would be a greater risk of injury both to the person submitting to the draw and to the person administering it, Miller said. Miller, a pathologist, said there always is a risk of infection with a blood draw because the skin can be cleaned but not sterilized. But she believed the risk of infection would be higher if the setting for the blood draw wasn’t very clean.